We welcome you and your children to our family dental office. We care for your child’s oral health through prevention, quality treatment, and positive motivation. We are committed to family-oriented dental care in a pleasant, comfortable and fun setting. We encourage parents to play an active role in their child’s oral health. Every child deserves to have a healthy smile! This starts with regular dental examinations and dental cleanings. Many parents ask when they should first bring in their child to see us. The Canadian Dental Association recommends that a child be seen by six months after the first tooth erupts or by one year of age, whichever comes first. This offers the opportunity to check that your child’s mouth looks healthy, and it starts a regular routine towards good oral care. How to keep your children’s teeth healthy? See us every 6 months for a check-up. Once your child is old enough, we will start dental cleanings. Our pediatric patients learn quickly that having shiny, sparkly clean teeth is important. We teach them how to do a great job at home. 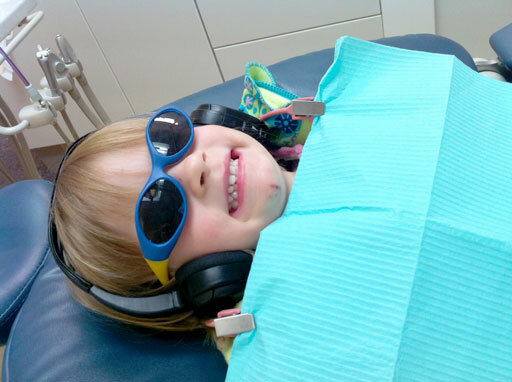 We find children improve their oral home care after having visited us for their routine exams. Brush twice daily with a small children’s toothbrush. The amount or kind of toothpaste used, is dependent on the child’s age. Please ask us, as our recommendations are dependent on your child’s age and their risk for cavities. Floss your child’s teeth, particularly any areas where teeth touch. These contact areas collect more plaque and bacteria, and require more thorough cleaning. Read your children fun dental books. This increases their knowledge about teeth and how to keep them clean. These books are also very helpful in preparing your child for the first dental visit with us. Eat healthy, balanced snacks, and avoid the sugary ones. Great snacks for healthy teeth are cheese, plain yogurt, and vegetables. Keep home oral care with your children fun and positive. Add music, laughter, and positive reinforcement. If it has been 6 months since your child’s last dental check-up and cleaning, it’s time to call us to book your appointment.